Myringotomy is a surgical procedure in which a small incision is made in the eardrum (the tympanic membrane), usually in both ears. The word comes from myringa , modern Latin for drum membrane, and tomē , Greek for cutting. It is also called myringocentesis, tympanotomy, tympanostomy, or paracentesis of the tympanic membrane. The doctor can withdraw fluid from the middle ear through the incision. Ear tubes, or tympanostomy tubes, are small tubes open at both ends that are inserted into the incisions in the eardrums during a myringotomy. The tubes come in various shapes and sizes and are made of plastic, metal, or both. They are left in place until they fall out by themselves or until they are removed by a doctor. 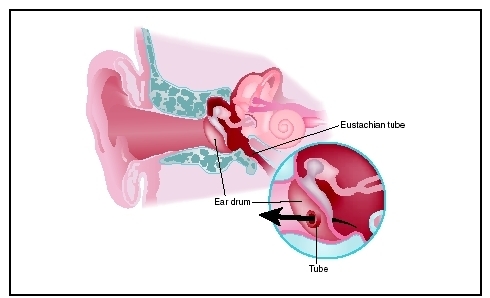 Ear tubes are also sometimes called ventilation tubes. Myringotomy with the insertion of ear tubes is an optional treatment for inflammation of the middle ear with fluid collection (effusion), also called glue ear, that lasts more than three months (chronic otitis media with effusion) and does not respond to drug treatment. Myringotomy is the recommended treatment if the condition lasts four to six months. Effusion is the collection of fluid that escapes from blood vessels or the lymphatic system. In this case, the effusion collects in the child's middle ear. Initially, acute inflammation of the middle ear with effusion is treated with one or two courses of antibiotic drugs. Antihistamines and decongestants have also been used to treat otitis media, but they have not been proven effective unless the child also has hay fever or some other allergic inflammation that contributes to the ear problem. Myringotomy with or without the insertion of ear tubes is not recommended as the initial treatment for otherwise healthy children with middle ear inflammation with effusion. In about 10 percent of children, the ear effusion lasts for three months or longer; at that point the condition is considered chronic. Systemic steroids may help children with chronic ear infections, but the evidence that these drugs are beneficial is not clear, and there are risks associated with steroid use. Myringotomy with insertion of ear tubes becomes an option when medical treatment does not stop the effusion after three months in a child who is one to three years old, is otherwise healthy, and has hearing loss in both ears. If the effusion lasts for four to six months, myringotomy with insertion of ear tubes may be recommended. Although doctors in the past sometimes removed the child's tonsils or adenoids to treat recurrent otitis media with effusion, this practice is not recommended as of the early 2000s. Myringotomy may be performed to relieve the pain and other symptoms of otitis media; to restore the child's hearing; to take a sample of the fluid to examine in the laboratory in order to identify any microorganisms present; or to insert ventilation tubes. Ear tubes can be inserted into the incision during a myringotomy and left there. The eardrum heals around them, securing them in place. They usually fall out on their own in six to 12 months or are removed by a doctor. While in place, the tubes keep the incision from closing, forming an open channel between the middle ear and the outer ear. This channel allows fresh air to reach the middle ear, allows fluid to drain out, and prevents pressure from building up in the middle ear. The patient's hearing returns to normal immediately and the risk of recurrence diminishes. Parents often report that children talk better, hear better, are less irritable, sleep better, and behave better after myringotomy with the insertion of ear tubes. The procedure is usually performed in an ambulatory surgical unit under general anesthesia, although some physicians do it in the office with sedation and local anesthesia, especially in older children. Most primary care physicians prefer to refer children who need a myringotomy and tube placement to an otolaryngologist. The insertion of ear tubes in the eardrum helps to alleviate chronic middle ear infections. The ear is washed, a small incision made in the eardrum, the fluid sucked out, a tube inserted, and the ear packed with cotton to control bleeding. Carbon dioxide lasers may also be used to perform the myringotomy. Laser-assisted myringotomy can be performed in a doctor's office with only a local anesthetic. It has several advantages over the older technique: it is less painful; less frightening to children; and minimizes the need for tube insertion because the hole in the eardrum produced by the laser remains open longer than an incision made with a scalpel. On the other hand, laser-assisted myringotomies have a higher rate of recurrence of infection. Another technique to keep the incision in the eardrum open without the need for tube insertion is application of a medication called mitomycin C, which was originally developed to treat bladder cancer . The mitomycin prevents the incision from sealing over. As of the early 2000s, however, this technique is still in its experimental stages. Some researchers have designed ear tubes that are easier to insert or to remove or that stay in place longer. As of 2004 clinical practice guidelines emphasized the importance of watchful waiting and medical treatment before performing a myringotomy and the importance of distinguishing between children at risk for speech or hearing problems from otitis media from others with chronic ear infections. A child scheduled for a myringotomy should not have food or water for four to six hours before being given anesthesia. Antibiotics are usually not needed before the procedure. The use of antimicrobial drops after a myringotomy is controversial. Water should be kept out of the ear canal until the eardrum is intact. A doctor should be notified if the tubes fall out. An additional element of postoperative care is the recommendation by many doctors that the child use ear plugs to keep water out of the ear during bathing or swimming to reduce the risk of infection and discharge. If the procedure is repeated, structural changes in the eardrum can occur, such as loss of tone (flaccidity), shrinkage or retraction, or hardening of a spot on the eardrum (tympanosclerosis). The risk of hardening is 51 percent; its effects on hearing were not known as of 2004, but they are probably insignificant. It is also possible that the incision will not heal properly, leaving a permanent hole in the eardrum, which can cause some hearing loss and increases the risk of infection. It is also possible that the ear tube will move inward and get trapped in the middle ear rather than move out into the external ear, where it either falls out on its own or can be retrieved by a doctor. The exact incidence of tubes moving inward is not known, but this possibility could increase the risk of further episodes of middle-ear inflammation, inflammation of the eardrum or the part of the skull directly behind the ear, formation of a mass in the middle ear, or infection due to the presence of a foreign body. The surgery may not be a permanent cure. As many as 30 percent of children undergoing myringotomy with insertion of ear tubes need to undergo another procedure within five years. The other risks include the usual risks associated with sedatives or general anesthesia. Parental concerns with regard to a myringotomy and tube insertion are usually related to the risks associated with the procedure itself, such as the child's reaction to the anesthetic, the possibility that the procedure will have to be repeated at a later date, and the risk of eventual mild hearing loss. These potential complications against the risks of language delay , possible learning problems, or hearing loss resulting from chronic otitis media. Acute otitis media —Inflammation of the middle ear with signs of infection lasting less than three months. Chronic otitis media —Inflammation of the middle ear with signs of infection lasting three months or longer. Effusion —The escape of fluid from blood vessels or the lymphatic system and its collection in a cavity. Middle ear —The cavity or space between the eardrum and the inner ear. It includes the eardrum, the three little bones (hammer, anvil, and stirrup) that transmit sound to the inner ear, and the eustachian tube, which connects the inner ear to the nasopharynx (the back of the nose). Tympanic membrane —The eardrum, a thin disc of tissue that separates the outer ear from the middle ear. It can rupture if pressure in the ear is not equalized during airplane ascents and descents. Tympanostomy tube —An ear tube. A tympanostomy tube is small tube made of metal or plastic that is inserted during myringotomy to ventilate the middle ear. See also Ear exam with an otoscope ; Hearing impairment ; Otitis media . "Acute Otitis Media." Section 7, Chapter 84 in The Merck Manual of Diagnosis and Therapy. Edited by Mark H. Beers, and Robert Berkow. Whitehouse Station, NJ: Merck Research Laboratories, 2002. Lanternier, Matthew L. "Otolaryngology: Ear Pathology." Chapter 20 in The University of Iowa Family Practice Handbook , 4th ed. Edited Mark Graber and Matthew L. Lanternier. St. Louis, MO: Mosby, 2001. Cotter, C. S., and J. R. Kosko. "Effectiveness of Laser-Assisted Myringotomy for Otitis Media in Children." Laryngoscope 114 (March 2004): 486–9. de Beer, B. A., et al. "Hearing Loss in Young Adults who Had Ventilation Tube Insertion in Childhood." Annals of Otology, Rhinology, and Laryngology 113 (June 2004): 438–44. d'Eredita, R. "Contact Diode Laser Myringotomy and Mitomycin C in Children." Otolaryngology and Head and Neck Surgery 130 (June 2004): 742–6. Koopman, J. P., et al. "Laser Myringotomy versus Ventilation Tubes in Children with Otitis Media with Effusion: A Randomized Trial." Laryngoscope 114 (May 2004): 844–9. Rosenfeld, R. M., et al. "Clinical Practice Guideline: Otitis Media with Effusion." Otolaryngology and Head and Neck Surgery 130, Supplement 5 (May 2004): S95–S118. American Academy of Pediatrics (AAP). 141 Northwest Point Boulevard, Elk Grove Village, IL 60007. Web site: http://www.aap.org. Jones, Michael, Leslie Wilson, and David Malis. "Otitis Media." eMedicine , September 21, 2004. Available online at http://www.emedicine.com/ped/topic1689.htm (accessed November 30, 2004). I have a 3 year old and soon to be 10 month old that the ped. had recommended to an ENT for ear infections and language delay (3 year old). I am concerned about the procedure and also about general anesthesia. I am also concerned with the loss of hearing and complications like never healing. I am trying to weigh the benefits logically and also gently. The 3 year old shows obvious speech delays and the therapists working with him have suggested that he would be able to communicate better with the tubes due to the fact that when he looks at you SPEAKING he can say it very clearly. So, anyway. Please give me some ideas if you can. I feel sort of like a fence sitter waiting for someone to say yeah or nay.